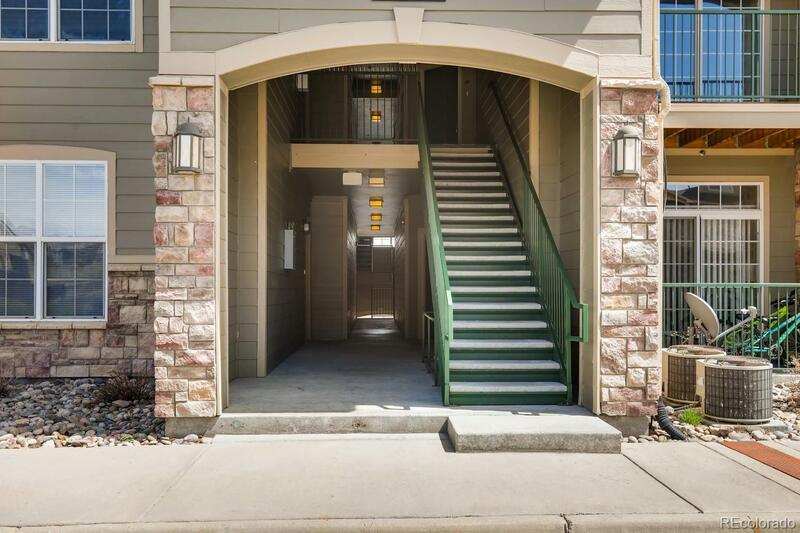 Single-level, beautifully maintained condo offers low-maintenance living with great community perks. Living hub features family room with convenient gas fireplace and access to private balcony. Opens to kitchen with full suite of appliances and peninsula breakfast bar. Dining nook with chandelier. Master bedroom has walk-in closet and 2nd private balcony. 2 bedrooms paired with 2 full baths is perfect set-up for roommates or small family. Central A/C. Community includes clubhouse, pool, fitness, tennis and outdoor hot tub and playground. Maintenance-free exterior means you never need to shovel or mow, and still get to enjoy professional landscaping. Steps from extensive open space & trails, playground, soccer. Great choice for anyone who likes to use their weekends for recreation instead of chores! MUST SEE!